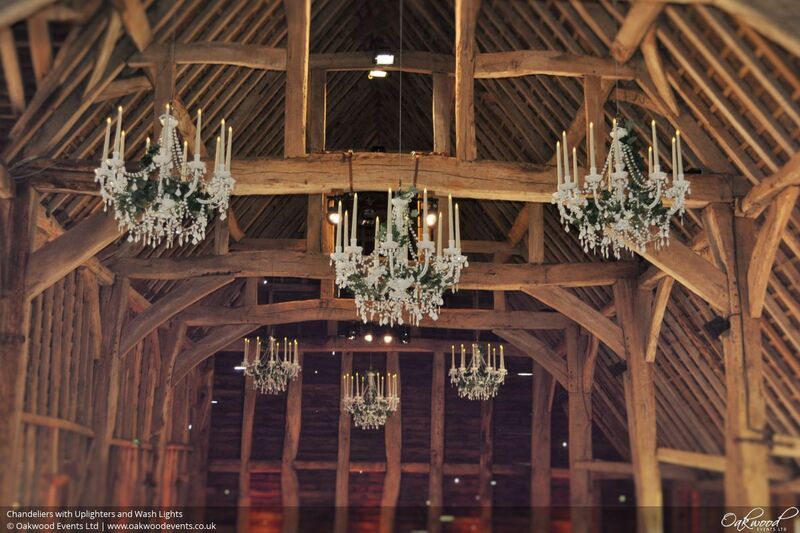 Barns are the perfect bespoke wedding venue, providing a blank canvas for you to express your personal style. Typically, they have gorgeous beams, pillars and stonework providing a backdrop to elegant, rustic, vintage and classic styles and they are in locations which exude exclusivity, beautiful views and unique features. Barns range in style from rustic to fully decorated, and the lighting that might be needed can vary widely. At one end of the spectrum, you might need only to add decorative lighting as a way of personalising the look of the venue for your event. Or it may be that your venue has little or no lighting of its own, and you need to fill the barn with light for both visual impact and safety. In both cases, we can help! The basic principles of lighting a space are the same for a barn wedding venue as they are at home, only on a much larger scale and often with significantly less time available to install it! Task lighting - light that is concentrated on an area intended for a specific purpose, such as serving at a bar. Accent lighting - primarily decorative, used to highlight features or as an effect in its own right. Ambient lighting - diffuse light used to fill in between the two types above for general illumination and to reduce shadows caused by more directional lights. In reality many forms of lighting can often be used to fulfil more than of these roles, for example chandeliers are both decorative in their own right while also filling an area with diffuse, ambient light. Simple flood lights aimed up into the ceiling space from the beams to highlight the ceiling and bounce ambient light back down into the room. These are often already installed in many barns but may not be dimmable. Chandeliers hanging from the beams, both as a feature and for more light output closer to the floor. Uplighters positioned around the walls as a visual effect and to bounce more light into the room at a low level to reduce shadows cast from above. In the context of a temporary installation for a wedding all of this must be achieved quickly, efficiently and without using any permanent fixings that cause damage to the building. Plus it must of course look good! Our services are designed to look spectacular as well as being functional, working with your other décor elements to transform the feel of the venue and define different areas such as the dining area and the dance floor. Lighting is the most effective way to to change the mood from day to night by dimming lights, changing colours or introducing different effects. A fairy light canopy that was bright enough to look impressive during daylight can be turned down to a starlight glow in the evening. Uplighters that gave a warm white fill-light in the day can change to a bold colour. Paper lanterns be be made to change colour and a mirror ball could be switched on to get the party started. We install our lights with easy to use controllers that take away the complexity of controlling all these different elements while giving you the flexibility to create exactly the atmosphere you want. Take a look through our range of services or contact us or to discuss lighting ideas for your event. 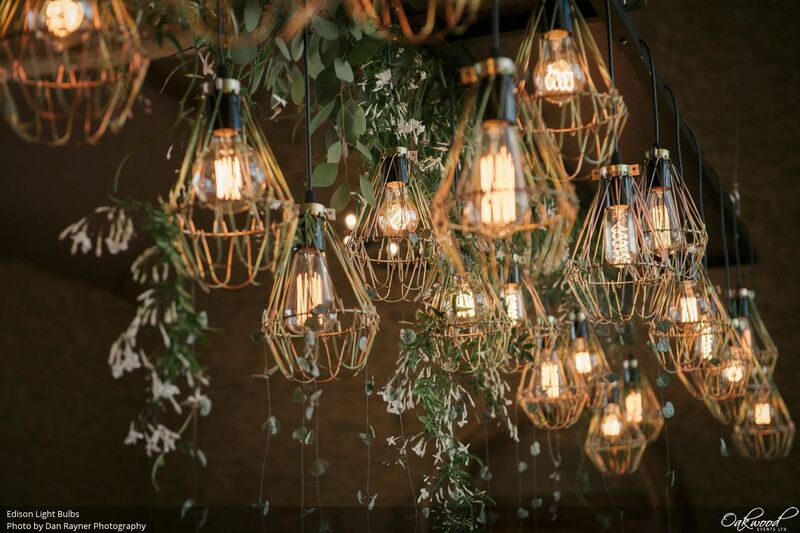 We have years of experience designing attractive, effective lighting installations for barn weddings and installing them quickly and efficiently on the day. For more examples of our barn lighting designs, see our Pinterest boards, where there are hundreds of images of our work. You can explore our range of services here, or to discuss lighting options for your event feel free to contact us here.